"The decorative arts over the centuries has seen the use of several metals in the creation of beautiful objects. Silver, Pewter and brass are just a few. Tin, gold and other metals will be found in this section of our site. If there is something you are looking for and do not see, please call or email us. It could be we have not cataloged the object yet." This impressive copper finial makes an impression. Architecturally significant, it was likely used in a commercial application of some kind. 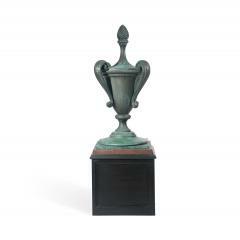 A nicely molded flame finial sits above a decorative urn with scrolled handles over a square base. The copper base has been reinforced with brass and zinc and rests upon a contemporary black painted pine pedestal.